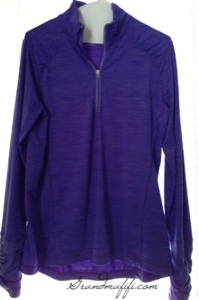 Costco is developing more Kirkland brand clothing, and one new item this summer was men's golf shirts. Here's great-grandpa in his new Kirkland golf shirt, on sale this week for $15. I'm really happy with this. There's been a lot on the Internet about the danger of liquid laundry pods, and some children, apparently thinking they looked like candy, have been sickened and even died by ingesting. At least one person questioned Costco's choice to put the laundry pods in a clear container. Now, according to the Internet and the picture in the new coupon book, the liquid laundry pod container is no longer transparent. 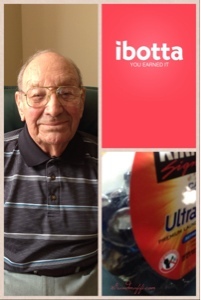 Ibotta is a complicated coupon system that works on a smart phone and claims to work with Costco purchases. I bought the product, photocopied my receipt (which took three separate photos), captured a copy of the price code, and was approved for $.25 cents back on my Costco purchase of eggs. But when I tried to find my $.25 cents, it was nowhere to be found. The email supposedly containing my money never arrived. 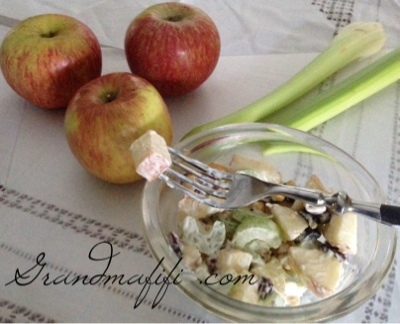 I haven't totally given up on Ibotta, but I'm skeptical. For various reasons, we've used a lot of band-aids recently, leaving us with the band-aid dregs - tiny rectangles and rounds. Having compared prices the last time I bought band-aids, I wanted to purchase at Costco. At Nashville Costco, I found a three-case pack for $12.00, but the contents list was very confusing. I never did figure it out, but bought them anyway. 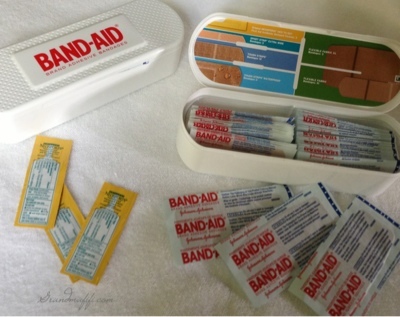 After opening, I was able to ascertain that each box contained 54 band-aids of various sizes (no useless tiny ones) plus three little squeeze packs of Neosporin - so over 162 in all, or over $.07 cents a band-aid. After checking at the local supermarket, this didn't seem like such a good deal. I could buy 100 band-aids there for $5.00 or $.05 cents each. The pack at Costco had more shapes, a hard plastic container, and small Neosporin packs. I could have saved money with the supermarket choice; but, since the paper band-aid boxes here always end up coming apart and scattering band-aids everywhere, I do like having the plastic container. My daughter took one of the three containers home to Brooklyn. If you can divvy them up, or if you have need for the hard plastic cases, this might be a good buy for you. I know that you can't judge an egg by the outside color. 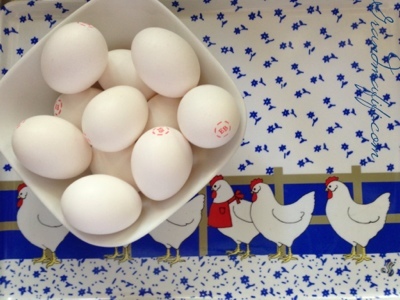 When I lived in the country outside Chapel Hill, NC, I had chickens, and had plenty of experiences that taught me, whether brown or white or speckled, the outside of an egg doesn't predict the inside. But I forgot. The lovely brown eggshells made them seem healthier, so I bought brown eggs at Costco. Purely by accident, I cracked a brown egg into two white eggs from my previous carton. The color of the brown egg yolk was completely different, pale yellow compared to the rich orange of the white-shelled egg yolks. The brown egg yolk looked sick beside the others. I think deeper food colors are generally better for you (spinach, kale, beets). The pale egg yolk convinced me to go back to the white-shelled eggs that I've been buying for years. The darker yolk makes them look healthier to me. But, but, but: I've also learned that chicken feed can contain chemicals such as lutein and zeaxanthin that make egg yolks darker. I'll stick with white-shelled eggs, but food chemicals and food science is complicated; I don't understand It. A helpless feeling makes me want to feel in control and "grow my own", but I won't revert to backyard chickens. When the hens get too old to lay, or if the chicks turn out to be roosters, keeping backyard chickens can be sad. Halloween candy is coming in to Costco, and I was happy to see this Kirkland Sunshine Candy Mix of hard candy, containing Werther's, Root Beer Barrels, Jolly Ranchers, fruit candies, mints, butterscotch. When I have a sore throat or cold, I want hard candy, and I've been hoping to get it at Costco. I didn't buy these for Halloween, but I might end up using some of this 7 lbs. of candy for Halloween. I'm going to have this candy for the rest of my life, aren't I? 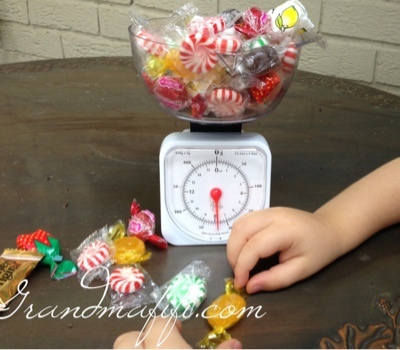 We told my 3 year old granddaughter, whose hands are in the photo, that this is "old people candy"; and she's shown minor interest. 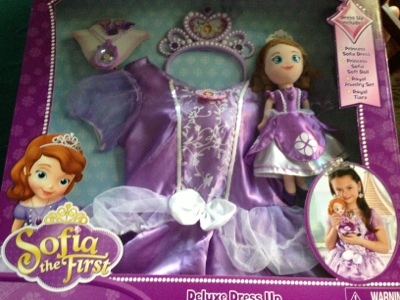 I was going to hold off buying these Sofia Princess sets until closer to Christmas, but they were selling so fast I began to worry they were selling out. Sunday, only a few were left, and after seeing a woman with two in her cart, I decided not to wait. Luckily, I have a visiting 3 year old to test out the set. The dress met with approval, not too scratchy, short enough not to trip over. She liked the large plastic locket. Earrings hurt, and the tiara was not worn. She slept with the Sophia doll. My granddaughter said the set needed Sophia slippers. She said she was familiar with the Sophia story, but I'm not sure she is. I know I'm not. Sophia is a new Disney Princess, the subject of a TV series that's not watched at my granddaughter's house. According to Wikipedia, over 7,500 apple cultivars have been developed. New cultivars are bred for taste, but, also, for disease resistance and productivity. One old apple variety, Rambo, was brought here from Sweden in 1643 by Peter Rambo, my 8th great-grandfather. Rambo apple trees are still available from specialty nurseries, but the apples are not for sale in grocery stores anymore. 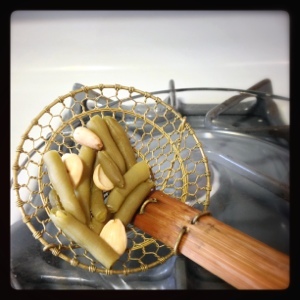 Stir together and chill. 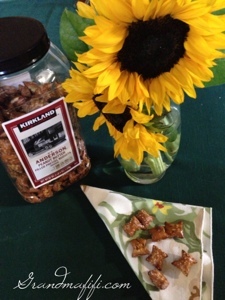 Using the Kirkland Sahale snacks as a substitute for walnuts worked great; any crunchy nuts would work. Some blogs have a regular post every week. 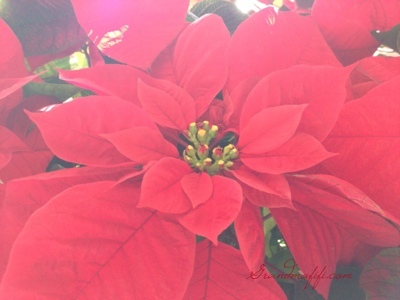 Amy Feezor's M-dashing blog has Monday on the Menu Board, and Ronni Bennett's Time Goes By has Interesting Stuffon Satuday. I've decided I need a way and time to post small snippets that don't require a complete post, but nevertheless should be mentioned. Like Ronni Bennett, I'm going to schedule those for Saturday. Four things happened this week. First, to follow up on the shooting at the Loudin County,Virginia, Costco last spring, the ruling came out that the Sheriff's deputies used reasonable force on the woman who was shot and killed at Costco while she was being a food demonstrator. A second story this week revealed that actor Bruce Willis loves Costco and has compared it to an art museum. In a third story, a footballer (soccer player) named Lois Suarez was thought to possibly be staying in Liverpool rather than moving to the London Arsenal team, which had targeted him to transfer. Since he was spotted with a full cart at Liverpool Costco, the press believes he's staying in Liverpool. And finally, it's true, some Christmas decorations are already for sale in the store. I've seen more than one complaint on social media about this, but since Costco sells to retailers, this doesn't bother me. I figure they're trying to help retail stores that have to plan store displays now. And I'm glad toys are back, because we have grandchildren visits in our near future! The local universities, Vanderbilt, Lipscomb, Belmont, TSU, are back in session, and Costco is full of college students and their parents measuring the furniture and stocking up on food. 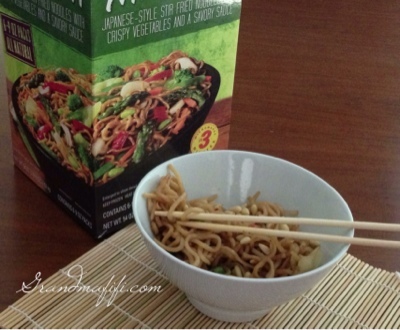 I saw one student with only one thing in his cart - Yakisoba frozen soba noodles. I had never tried these, but this was a sign. 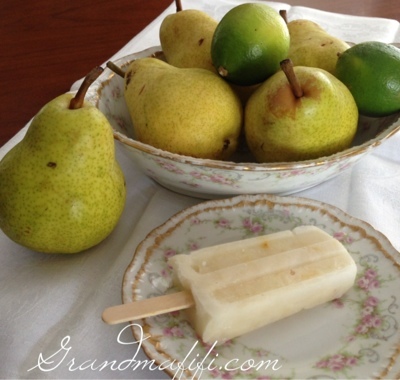 So simple - three minutes on high in the microwave. I added a handful of Costco fully-cooked tail-off shrimp, a little chopped Costco roast chicken, and 1/4 cup toasted pine nuts, and the two of us could easily split one package. When we lived in Japan in the late 50's, I remember soba carts everywhere, but never trying them. I'm sure we would have had a significant language barrier; but, still, we missed so much. This box contains six 9 oz. packages of 500 calories each. 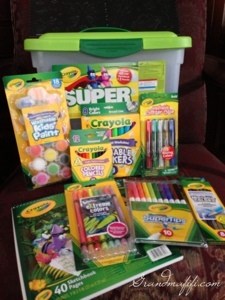 I paid under $12.00 for the box which is less than $2.00 each package. I foresee these becoming a staple here. I saw a young Asian woman looking at the Harvest Moon Cake tins in Costco; she seemed surprised and happy to see them there. "Are those any good?" I asked. "Oh, they're wonderful. I grew up with these." Pausing, she looked at me. "They might be an acquired taste though." Moon Cakes, I learned, are traditionally given to friends and family on the occasion of the Harvest Moon Festival, one of the four most important holidays in China (this year, September 19-21). The cakes are very complicated to make, so are usually a bakery product. Auspicious words in Chinese are formed on the tops; the cakes contain bean or seed paste, and salted hard egg yolks to mimic the harvest moon. 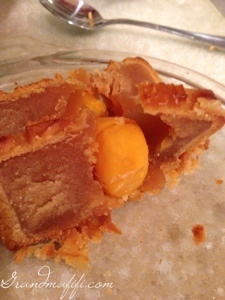 The Joy Luck Palace Moon Cake tin at Costco contains 4 cakes; each cake has double salted egg yolks and lotus seed paste. It's true, the taste is different, but for an interesting cross-cultural experience, celebrating the Moon Festival seems like a great adventure. I learned by experience to cut the cakes in wedges so everyone gets part of the "moons". I've ordered Round is a Moon Cake, a children's picture book, and will share the Moon Cake story and the Harvest Moon Festival with my granddaughters. I love Costco for carrying things like this. Here's a famous poem about the Moon Festival from poet Su Shi, (1039-1112). I don't particularly get a connection to festivals or cakes, but there you go. motorized shopping carts and wondered how they worked? Yesterday, I took my 93 year old Dad to Costco. The person checking membership cards at the door made sure my Dad understood how to stop, go forward and reverse the cart. All the controls are on the steering mechanism. The ride is very smooth, but not as fast as a fast walk. 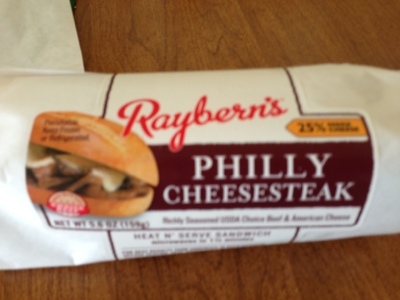 In a freezer aisle, we were mesmerized by the Raybern's Philly Cheesesteaks. After standing (and sitting) in front of the freezer case for a full minute of indecision, we grabbed them. (I was pretty sure, if Costco had them, they were good.). My Dad, who grew up outside Philadelphia, said, "you would probably have to go to Philly to do any better." 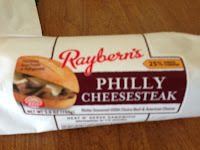 Eight in a package, not gigantic, but very filling; cooked perfectly after 90 seconds in the microwave, about 400 calories per sandwich. I've decided people don't really like pharmacists. I come to this conclusion reluctantly, I was going to go off on modern pharmacists comparing them to their much beloved brethren of yore. They knew where everything was in their immaculate stores. But, when I started to think of well-known and loved fictional pharmacists, I couldn't come up with any. 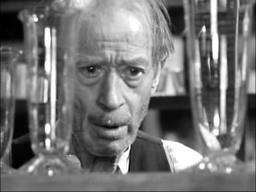 The first pharmacist I thought of was Mr. Gower, the pharmacist from It's a Wonderful Life. Without George Bailey to catch his prescription error, we all know how that would have turned out. Then, I remembered the creepy Monsieur Homais from Madame Bovary; he epitomized the worst of the bourgeoisie. I began to question my assumption that pharmacists used to be well-loved. Bob maintains there is a good pharmacist in The Natural and that Patrick Cleburne, Civil War General, was a pharmacist and a good guy, but there are always exceptions. 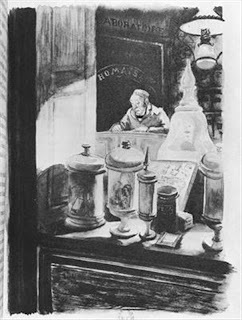 Maybe pharmacists haven't changed as much as I thought. Which leads me to my complaint. 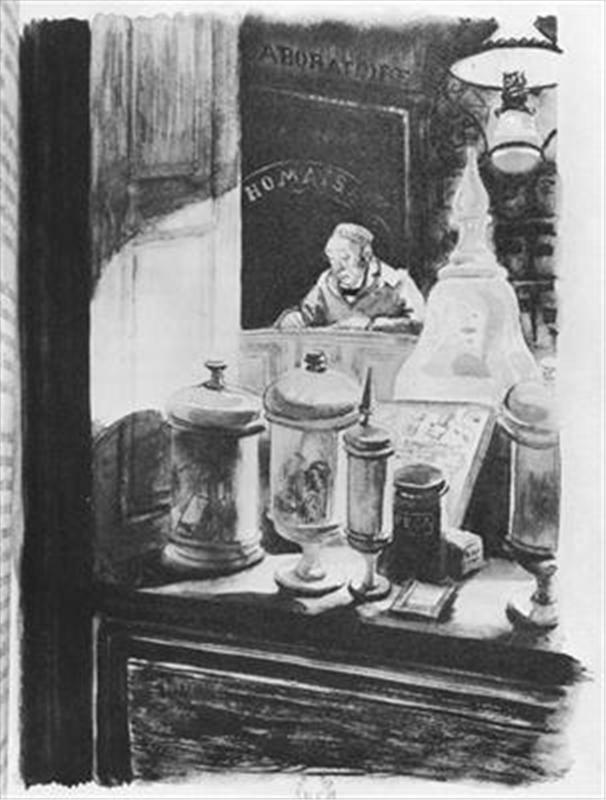 Pharmacists are druggists, meaning they should know what drugs they have in the store where they work. Just because the drug is not behind a little glass wall does not mean that one should say, "If we have it, it would be down that aisle; if it's not there, we don't have it." I looked there. That's why I'm asking you. Look it up, pharmacist, or get one of your 'leventy million helpers back there to look it up. If no one in pharmacy knows how to look up stock in the store, ask for retraining. If you haven't ever tried H. K. Anderson Peanut Butter Filled Pretzels, and you're not sure if you would like them, if you like peanut butter and pretzels, you will like these. Nutritionally, not too bad per serving with 5 grams of protein, 8 grams of fat. The Kirkland label is an additional guarantee of quality. 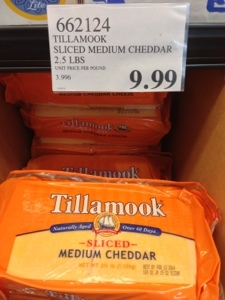 At Costco, I paid $7.59 for 3 lbs. 4 oz. (52 oz.). These sell in other stores in small packages for $1 for 3.5 oz. My Dad used to eat these on the golf course. I guess if you're rounding the first nine without lunch, you might need something to keep you going. I, on the other hand, am never that far from a regular meal, so I have no excuse for eating snacks. Nevertheless, here they are in my kitchen. I hope I don't eat too many. In the June Costco earnings call, Costco discussed expansion of Kirkland Brand athletic wear. I posted about their summer capri length pants, now the winter styles are in. I was happy to see the neckline in the women's long-sleeve shirt. The previous crew-neck wasn't flattering. This "1/4 zipper" opening looks better on me, and, I'm guessing, many others. The shirt comes with details you might expect in more expensive athletic wear, such as thumb holes and cuffs to pull down over your hands and a plastic tab on the zipper in case of extreme temperatures. Color choices are happy and bright, and, for yoga class, or just looking like I stopped off at Costco on my way home from yoga class, these will be great. The price is under $20. Crabby, Asthmatic, but Trying to Empathize about Your "Service Animal"
I started blogging because I was inspired by Ronni Bennett from Time Goes By. 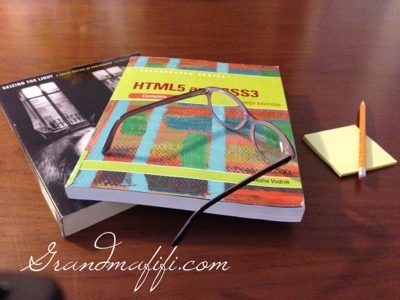 She advocates blogging as a great hobby for older people, and I agree. She calls herself Crabby Old Lady, and, sometimes, she is, but mostly she's not. 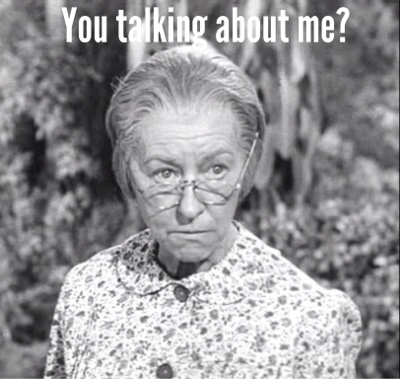 I think that mostly, I'm not a Crabby Old Lady, but sometimes, I am. When I was little I had terrible asthma, I've ended up at the emergency room more than once as an adult because I needed emergency asthma intervention. I'm very allergic to animals. Three times recently I've been in Costco when people were accompanied by phony "service animals". Now, I'm not someone who can claim to love animals. I'm not an animal person. But I particularly don't want to be around over-groomed animals in bows trotting around my grocery store, pretending to be "wink, wink" service animals. Who are these people accompanying these obviously spoiled pets? The people actually look pretty raggedy compared to the fussy little dogs. 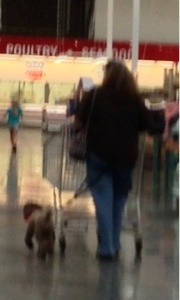 I began to wonder: what could make you think taking your dog to Costco was a good idea? Maybe these folks aren't just stopping at Costco on their way home from sashaying their pet around PetSmart. Maybe these people are afraid to leave their houses without their pet, maybe they are severely agoraphobic!? Maybe they couldn't ever even visit Costco unless they brought their dog! I'm trying to reframe this entire thing. Now I feel guilty for being so judgmental. Still don't like pets in the store though. Brownie Brittle seems to have taken off as a snack, and we like it too. 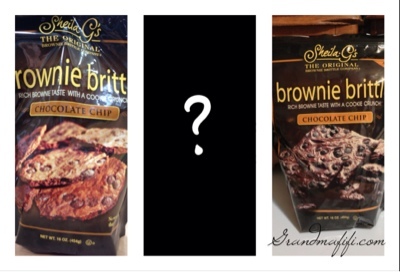 The lore of this snack is that Sheila G. liked the burnt edges of brownies the best, so created a snack that consisted of cookies that taste just like brownie burnt edges. I was a little disconcerted by the packagiing changes I noticed last time I was in Costco. The old package had a much lighter photo, the new photo is darker. The old package said "All Natural" in the upper right corner. The new package says "Made with Natural Ingredients". The ingredients listed on the two packages are slightly different. I tried the new Brownie Brittles on Bob, and he didn't seem to notice any difference; so I'm not too concerned about this. Although, it did make me wonder what the "natural" label meant on food. I found this article on nutritional labeling that explains that the word "natural" doesn't have a great deal of meaning. Still, ALL natural seems better than implying that just SOME of the ingredients are natural. 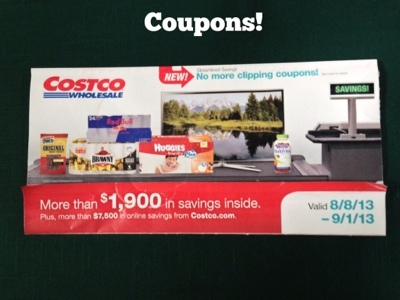 The new Costco coupons start Thursday, August 8th. Again, Kimberley over at Addicted to Costco has posted the coupon book PDF. 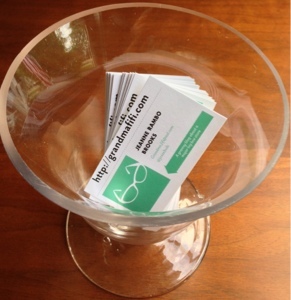 Don't print these out; copies don't work. Coupons are changing - now you MUST have the actual book (no coupon cutting) or the Costco app on your smart phone. I'm looking forward to seeing the app work. If you don't want this on your phone or didn't get this in the mail, talk to the Service Desk to make sure you're on the mailing list. Most of these coupons are for brand name items; and, since I try to use Kirkland as much as possible, most of this is not for me. 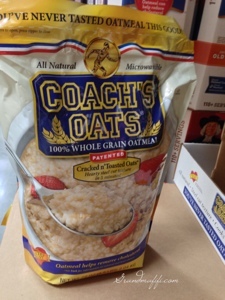 I am so happy to see Coach's Oats in my Costco We started eating this a couple years ago, and then it disappeared. I found it in the grocery stores but in very small packages for very large prices, so Amazon was my source for a while. I love this oatmeal; there's a slight nutty, toasted flavor that makes the oatmeal taste better. I'm hoping Costco keeps it permanently.